Thank you messages for team members: A company’s success is driven by teamwork, not just by individuals because it takes a combined effort to meet monthly targets and KPIs. Every boss, manager and colleague should ideally acknowledge and recognize his or her team member’s contribution in everyday work life. Formal and informal notes of thanks are generally given after completion of projects, assignments, deals and meetings. If your shout out to your team is highly overdue, read this post to get ideas to write your own thank you quotes for your team. Send them as emails, scribble them on greeting cards or use them in a speech – do whatever it takes to show your colleagues how thankful you are for their support and help. 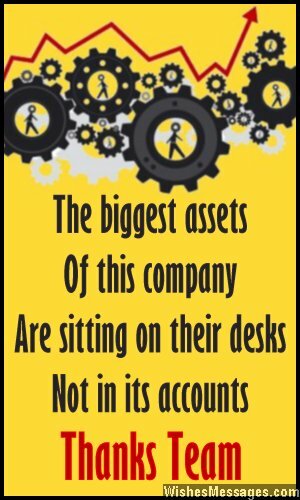 1) The biggest assets of this company are sitting on their desks, not in its accounts. Thanks team. 2) May we always be like marching ants carrying one grain of sugar at a time – falling again and again but never giving up until we reach the top. Good job team, thank you. 3) The everyday work life of most other teams is based on rules, procedures and instructions. Ours is based on trust, cooperation and support. Thanks for being such a wonderful team. 4) There is no other greater source of inspiration and motivation than to walk into work every morning and be greeted by smiles of friendly and supportive team members like you. Thanks. 5) Even failure can’t be disappointing when it has to be shared with hard working team members like you. Thanks for giving it your best shot. 6) I asked for commitment, you gave me dedication. I asked for obedience, you gave me authority. I asked for cooperation, you gave me support. Thanks for everything, team. 7) Our competitors had everything it could possibly take to clinch the deal – except a dream team like you guys. Thank you for pulling us through. 8) If we didn’t work together like a swarm of bees, we would have never achieved success as sweet as honey. Thanks for an excellent job team. 9) A team’s job is to work like a well oiled machine. Thanks for doing just that. 10) The wiki page on Teamwork should simply have your pictures because you all are an exemplary team. Thanks for everything. 11) A team is like a stack of cards which collapses when one becomes weak. Thank you to each and every member for holding up all this while. 12) Influential bosses like me would be powerless if they were not backed by strong teams like ours. Thanks for the wonderful job team. 13) A great team is like a parachute that you can use when you are about to hit rock bottom. Thanks for being my parachute. 14) A team is not about joining hands, it is about joining hands no matter what. Thank you all for sticking together when the company needed it the most. 15) When I expected good, you gave me better. When I expected better, you gave me best. When I expected best, you have me extraordinary. Thanks for being an exemplary team. 16) The best and worst part of working with team members like you is that the benchmark is always set very high. Thank you for being exemplary. 17) The real definition and meaning of teamwork is not found in management textbooks, but in the minds and hearts of team members like you. Thanks guys, you are the best. 18) You guys are a rare bunch because you work just as hard as you party. Thanks for your efforts. 19) My strength is that I have an awesome team and my weakness is that I can’t do without them. Thanks for contributing to my success. 20) Everyone took my side when I was right. But only you stood by me even when I was wrong. Thanks for being a true team player. 21) TEAM is just a fancy name for family at work. Thank you all for being such a caring family. 22) The reason I am never afraid of scaling greater heights is because I have an awesome team members like you to catch me if I fall. Thanks. 23) You all have taught me the biggest lesson of my career – don’t treat a team member like just another player, treat him like your brother. Thank you. 24) Deep down inside, every manager knows that every dollar of his salary depends on each and every member of his team. Guys, thanks for putting the dollar in my pocket. 25) The company expected your one hundred percent in this assignment. You gave ten times more. Thanks team. 26) I prayed to God and asked Him to give me a hand on this project. Instead, He gave me much more – a backbone in the form of a wonderful team like you all. Thanks guys. 27) Without your contribution, this project would just have been just another dream. Good going, team. 28) We were not just a team, we were a family that fights and loves each other at the same time. Thanks. 29) A team like ours wins even when it loses a deal, because it makes us all the more determined for the next one. Thanks for trying your best, team. 30) Individually, we all have our own weaknesses and strengths. But together, we can reach great lengths. Thanks for being a dedicated team. 31) When it comes to you guys, the word TEAM is actually the acronym for Terrific Enthusiastic Ambitious and Motivating. Thanks for being the best TEAM ever. 32) Thanks to you all, clinching deals is easier than buying candies. Good job team. 33) You guys have once again proved that a company’s success is a joint effort by a good team and not just a good leader. Thanks, each and every one of you for your hard work. 34) You guys did a great job, but if you guys become any more efficient and self-sufficient, my job as your manager may become redundant. Thank you all. 35) I am not a good team leader. I am just a representative of great team members. Thanks guys.